We have just received our last shipments from Burundi in to the UK warehouse. These coffees are from the later pickings of this year’s harvest. We think these coffees definitely have a place in the high-end market and are generally undervalued. They work well both as espresso and filter, and are in our opinion very well priced compared to the quality and flavor attributes. Considering there are still many months until the new harvest of Ethiopia, Kenya and Centrals arrive in Europe, we hope that these coffees (among others) are able to fill that gap on seasonal coffee. We want to get these coffees introduced while still fresh, as well as we want to turn them over quickly to have our cash flow going for the purchase of other coffees within the next three to five months. We have therefor decided to offer them with a very low markup from our end. These new coffee arrivals are mainly from private Coffee Washing Stations in our favorite areas of Kayanza. The producers are investing a lot in quality control and also sustainability programs for the surrounding farmers and local workers. As they are separating their coffees based on daily pickings and different processing methods it is possible to make a very specific selection of micro lots based on the different flavor profiles. Overview of Buziraguhindwa washing station. With coffee grown at altitudes up to above 2000 meters, good rainfall and volcanic soils the growing conditions are good. With a diverse flavor range from mature dark fruit flavors to complex citrus, currant and stone fruit, Burundi is one of the most promising African coffee countries in regards to cup quality. The coffee can be everything from subtle, complex, rich and dense with a medium acidity level, to lively, citrusy and very intense. We are pre-financing our producers in Burundi. 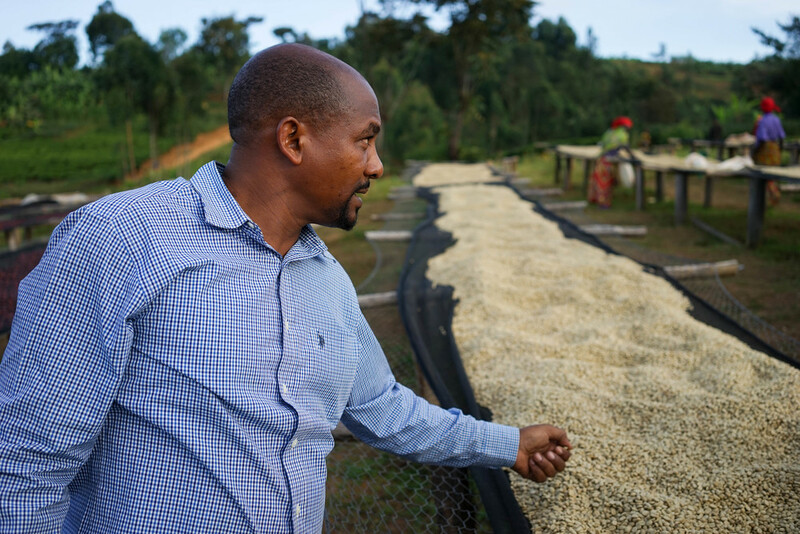 The biggest challenge for the producers in Burundi is access to finance up front of the season. They all need cash to be able to start buying cherries. In most other countries it’s possible to access loans from the banks or micro finance from international organizations if your having contracted coffee up front of the season. In Burundi this options is still very limited. We have therefor started to partially pre-finance our producing partners. This means we are giving them an advance to secure our supply. There are about 600 000 farmers in Burundi and most of the coffees are grown by smallholders that either process the coffees at their farm with a handpulper or sell and deliver cherries to their local communal washing stations. All our producers are buying cherries from smallholders who normally have some 100 trees each. If they are close enough to the washing station to deliver directly they pick anything from 5 to 100 kgs of cherries pr day and deliver it directly. Normally they get paid cash on the spot. In the case of producers buying cherries in more remote areas they normally have what is called site collectors — they represent the washing station and buy cherries on their behalf. This means that a daily lot of roughly 25 bags of greens can consist of coffee from some hundred growers. Mr. Salum Ramadahn, the producer and owner of Buziraguhindwa washing station. Most of the coffees we are currently offering are from the Buziraguhindwa washing station owned by the producer Salum Ramadhan. The coffees are basically all selected daily lots, named by the local area or Colline (hill) where the cherries are purchased. He is systematically separating the coffees based on where they are grown, and by the date of processing. The cherries are moved to the Buziraguhindwa washing station by the day of purchase all to be processed there under the same quality criteria. Post-harvest, we are cupping through some hundred samples to select the ones we find outstanding. They generally collect cherries from a range of areas with different altitudes, growing conditions etc, and the flavor range is pretty wide according to that. The coffees named Buziraguhindwa are coffees from the surroundings of the washing station. Coffees with names like Nyabihanga, Sehe, Muruta are coffees grown in other areas, but processed with the same method as Buziraguhindwa. You can read more about the coffees from Buziraguhindwa and Salum Ramadhan here. You can read more about the two producers here. We have put together a short film that shows the processing at Buziraguhindwa. Together with the film from Rwanda that we released earlier this year, they give a pretty good overview of the processing in these two countries as a whole.